Self contained rustic water feature. outdoor water feature will create a pleasant trickling sound. Garden water feature is made from a ceramic effect resin design. 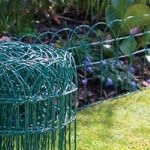 Water feature for garden is supplied with pump with 10 metres of cable with fittings and instructions. Water garden feature has an water capacity of 0.4 litres. Measurements: 60cm high x 30cm wide x 30cm deep. 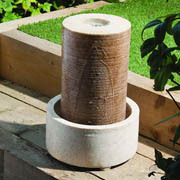 Fountain water feature of a Sandstone Column is manufactured from in mould from poly stone for a realistic effect. Water feature fountain is ideal as a contemporary outdoor feature with LED illumination, ideal for gardens, patios and decking areas. 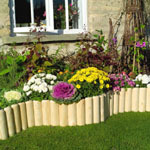 Water feature gardens are supplied with pump and 10 metres of cable and full instructions. 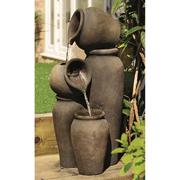 Water feature outdoor holds 4.8 litres. Measurements: 42.5cm high x 28.5cm wide x 28.5cm. Click here for larger picture of water feature in garden. 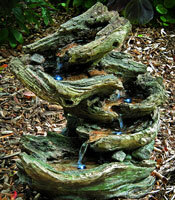 These Barrels with cascading water has LED illuminated water feature. This water feature is for use as an outdoor water feature and comes complete with 10 metres of cable. This outdoor water feature has realistic barrel effect made from heavy-duty resin material. The water capacity of this fountain water feature is 9.9 litres. Comes complete with fittings and instructions. Size: 57cm high x 39cm wide x 35cm deep. Classic illuminated outdoor water feature. 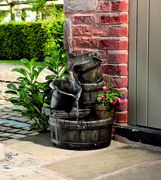 This home water feature will add charm to your garden. This contemporary water feature is supplied with 10 metres of cable, pump, fittings and instructions. Patio water feature has a water capacity of 18 litres. Measurements: 70cm high x 45cm wide x 50cm deep. A very appealing indoor water feature with build in LED light looks stunning in any room. The three coloured attached pouring jugs are supplied with a pump. This beautiful water feature is made from robust polyresin and is hand-painted. Comes with 3 metres of cable. Height: 29cm.Width: 15cm x Diameter 16cm.Water capacity 0.75 litres. These outdoor water features are realistic looking and are hand painted finished in a timber effect. The Woodland water feature has a meandering ?ow with L.E.D lighting. 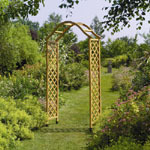 These water features come Supplied with pump ?ttings, instructions and with 10 metre length cable. Made from to look like a natural timber effect in painted poly resin material.